Greg Maddux began his career as a member of the Chicago Cubs and his first 7 years as a pro were nothing short of spectacular. He won the Cy Young Award in 1992 and posted double digit wins in 6 seasons on Chicago's Northside. Because Maddux carved a career as a dominant pitcher and popular player in two great baseball cities he chose not to declare a team for his Hall Induction. For Cubs fans Louisville Slugger has created this very special full size two-tone Cubs edition Commemorative Bat as a tribute to his years in Chicago and accomplishments. Over his career Maddux was a four-time Cy Young Award Winner, 8 time All Star, and won 355 games. He struck out over 3,300 batters and retired with a career ERA of just 3.16. Maddux was nearly a unanimous choice for the Hall, named on over 97 percent of ballots cast in his first year of eligibility. 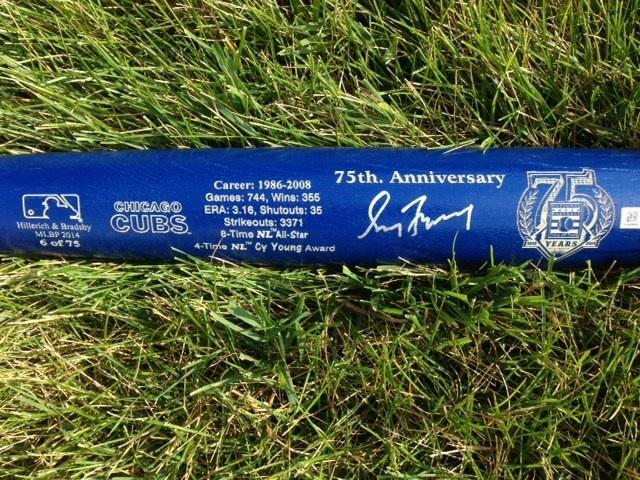 This amazing Maddux signed bat is laser engraved with Maddux's career stats and key dates, and makes a terrific addition to any collection of a Cubs fan or admirer of baseball's greatest pitchers. The bat is personally signed by Greg Maddux. This signed bat will look great displayed on any wall ... anywhere! Get yours today. Due to the limited nature of this offer we must charge your credit card for the full amount immediately upon taking your order. This policy ensures we reserve a bat from the series for you. We will confirm your order by Email. This bat is not game used. Please allow 4 to 6 weeks for delivery. 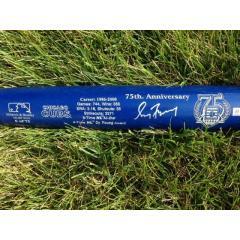 Greg Maddux Signed Hall of Fame Commemorative Bat - Cubs Edition $695.00 Sold Out!